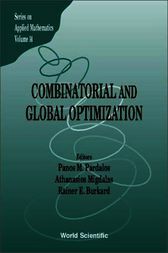 Combinatorial and global optimization problems appear in a wide range of applications in operations research, engineering, biological science, and computer science. In combinatorial optimization and graph theory, many approaches have been developed that link the discrete universe to the continuous universe through geometric, analytic, and algebraic techniques. Such techniques include global optimization formulations, semidefinite programming, and spectral theory. Recent major successes based on these approaches include interior point algorithms for linear and discrete problems, the celebrated Goemans–Williamson relaxation of the maximum cut problem, and the Du–Hwang solution of the Gilbert–Pollak conjecture. Since integer constraints are equivalent to nonconvex constraints, the fundamental difference between classes of optimization problems is not between discrete and continuous problems but between convex and nonconvex optimization problems. This volume is a selection of refereed papers based on talks presented at a conference on “Combinatorial and Global Optimization” held at Crete, Greece. Readership: Researchers in numerical & computational mathematics, optimization, combinatorics & graph theory, networking and materials engineering.